This summer we are trying something new with the boys, they get to plan one meal a week and help make create it. This should prove to be quite interesting to say the least. Spencer was up first and he wanted a dish with ham, the one he requested we did not have all the ingredients for which left us looking at other recipes to try. We found this yummy recipe at the Taste of Home website and off we went whipping it up. We did double the recipe, we substituted dried parsley for fresh and Spence wanted to add in some peas (which we did). This meal was quite tasty, easy to create and even had oldest son going for seconds! Cook spaghetti according to package directions. Meanwhile, in a small bowl combine the cheese, soup, milk, parsley, pimentos, onion, Worcestershire sauce, and pepper. Drain spaghetti; add to soup mixture. Spread half into a 1 1/2 quart baking dish coated with cooking spray. 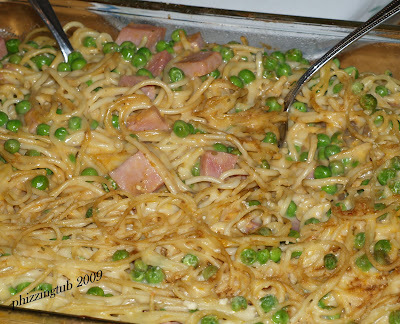 Layer with ham and remaining spaghetti mixture. Bake, uncovered at 375 for 20-25 minutes or until bubbly. Per Serving: 338 Calories; 13g Fat (34.9% calories from fat); 25g Protein; 29g Carbohydrate; 3g Dietary Fiber; 58mg Cholesterol; 1050mg Sodium. Exchanges: 2 Grain(Starch); 2 1/2 Lean Meat; 0 Vegetable; 0 Non-Fat Milk; 1 Fat; 0 Other Carbohydrates.